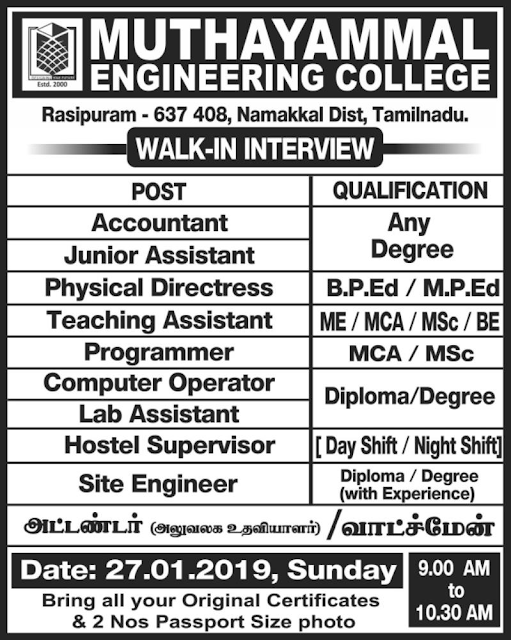 Muthayammal Engineering College, Namakkal has advertised in the DINATHANTHI newspaper for recruitment of Non-Teaching Faculty jobs vacancies. Interested and eligible job aspirants are requested to walk-in on 27th January 2019. Check out further more details below. How to Apply: Interested and eligible candidates are requested to attend the Walk-in interview along with originals & copies of certificates, testimonials and 02 recent Passport Size photograph to the walk-in address mentioned below.